I know how to create normal notifications like the blue bordered notifications in this image, but I want to show an icon and about 3 lines of information near that. How can I do that? Any suggestion will be appreciated. The NotificationCompat.Builder is the most easy way to create Notifications on all Android versions. You can even use features that are available with Android 4.1. If your app runs on devices with Android >=4.1 the new features will be used, if run on Android <4.1 the notification will be an simple old notification. 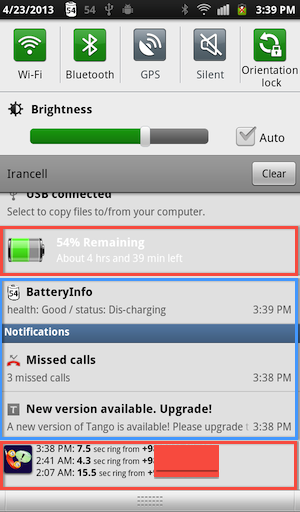 Expanded notifications are available from Android 4.1 onwards to handle these scenarios. If you are using Notification.Builder or NotificationCompat.Builder, you would set up a normal Builder and a separate Builder for the expanded notification, using NotificationCompat.InboxStyle or one of the other styles, and connect the two. Not the answer you're looking for? Browse other questions tagged android notifications or ask your own question. How to add my custom layout in top of notifications in status bar?